Definition at line 16 of file CQComboDelegate.h. 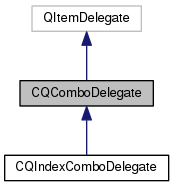 Definition at line 18 of file CQComboDelegate.cpp. Definition at line 26 of file CQComboDelegate.cpp. Definition at line 29 of file CQComboDelegate.cpp. References currentIndexChanged(), getItems(), mEditorToIndex, slotCurrentIndexChanged(), and slotEditorDeleted(). Referenced by createEditor(), and slotCurrentIndexChanged(). Definition at line 87 of file CQComboDelegate.cpp. Referenced by createEditor(), and ParameterTable::slotCellChanged(). Definition at line 128 of file CQComboDelegate.cpp. Definition at line 134 of file CQComboDelegate.cpp. Definition at line 57 of file CQComboDelegate.cpp. Definition at line 82 of file CQComboDelegate.cpp. Referenced by CQExperimentData::setTypeItems(), and ParameterTable::updateTable(). Definition at line 68 of file CQComboDelegate.cpp. Definition at line 104 of file CQComboDelegate.cpp. References currentIndexChanged(), mCommitOnSelect, and mEditorToIndex. Definition at line 122 of file CQComboDelegate.cpp. Definition at line 76 of file CQComboDelegate.cpp. Definition at line 61 of file CQComboDelegate.h. Referenced by isCommitOnSelect(), setCommitOnSelect(), and slotCurrentIndexChanged(). Definition at line 58 of file CQComboDelegate.h. Referenced by createEditor(), slotCurrentIndexChanged(), and slotEditorDeleted(). Definition at line 56 of file CQComboDelegate.h. Definition at line 59 of file CQComboDelegate.h. Referenced by getItems(), and setItems().